www.mandingoscrolls.blogspot.com Sierra Leonean Writers Series, 2017. 264pp. ISBN-10: 9988869797; ISBN-13: 978-9988869793. ‘My Afro-Canadian Chronicle’ not only discovers a family background and helps the author to establish a sense of personal identity and self-worth but also it sheds light on the devastating effects of underdevelopment on a country that went through one of the most atrocious civil wars in modern history. The autobiography answers the questions of what it is like to be born and raised in a pre- and post-independent Sierra Leone, and to reside and work in Canada, one of the most peaceful multicultural democracies in the world. It is perhaps just providence that this book was published in a decade and a lustrum after Aminatta Forna first published her book entitled ‘The Devil That Danced on the Water: A Daughter’s Quest.’ Forna’s autobiography was an authoritative prose on post-colonial African political bankruptcy. Her denouement was one in which she revealed a plot that infiltrated the corridors of power; she portrayed her father’s land as a bedrock of intolerance and malfeasance. Today, as in the 1970s, Sierra Leone, like most African countries, is more dependent on developed countries for its livelihood. 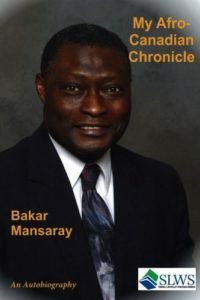 As an African-Canadian, Bakar Mansaray’s book is irresistible. His style is relatively subjective; he chronicles his experiences while recognizing people’s right to free speech, liberty and pluralism. The book begins with Bakar’s childhood and his fascination with the vulture. His birth is a leap of faith for his mother, a great custodian of folklore. He is unlike his companions with his esoteric and humble cosmos interacting almost perfectly. He remembers the fear that engulfs him at the sight of the picture of Nebuchadnezzar, a king of Babylon in biblical times, who lost his sanity as a punishment for his pride and vanity. He narrates about schools that instil wisdom into his mind by caning the devil out of him whenever he is foolish enough to fall foul of these authoritarian faculties; educational institutions that allow him to wear his faith on his sleeve. Bakar portrays two different societies; one which mires in poverty and corruption, and another based on fairness, inclusion, and democracy. A Ulysses sinking star-like undertone of the need to strive, to seek, to find and not to yield infuses the scenes, and this undertone emerges in Chapter 9, entitled ‘The Canadian Dream’, when Bakar graduates with a Master of business Administration degree from Athabasca University’s Centre for Innovative Management. But his dream has a fantastic spin – which I would leave for the reader to discover. In the book’s concluding chapter, Bakar mentions social traits like having caring and supportive relationships within and outside the family that helps him deal with difficult times; the impropriety of having annoyingly high, and unwisely low expectations for his friends. Of value is the book’s postscript, entitled ‘Sierra Leone in Retrospect’, which is a speech delivered by the author as a keynote speaker at the 56th Sierra Leone Independence Anniversary celebrations organized by the Sierra Leone Association of Alberta in Edmonton, Canada. His speech poses the questions of being truly independent; of developing faith in the country’s health professionals rather than seeking medical treatment overseas; of having confidence in the country’s universal primary school education rather than enrolling children in expensive private schools; of developing the agricultural sector instead of depending on foreign aid to feed ourselves; of tribalism and corruption; and of canonizing wrongdoers and demonizing the righteous. The author’s unassuming merciful style is likeable. Some of the book’s weaknesses are Bakar’s invitation of more questions than answers; his brief narration of underemployment and racial discrimination in Canada. However, the book presents a priceless and captivating view of life in two completely different societies that is for some of us unreachable. As autobiographies go, ‘My Afro-Canadian Chronicle’ may not have the bitter ramifications of Aminatta Forna’s ‘The Devil That Danced on the Water: A Daughter’s Quest,’ or the Swahilian-type intuitiveness of Ngugi wa Thiong’o’s ‘In the House of the Interpreter’, but there is something virtually quintessential about one man’s endurance to tell a story only a mind as luminous as the author’s can tell.